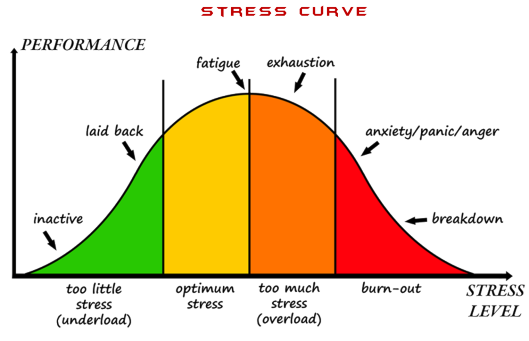 Not enough stress and people get bored; they feel as if they are not challenged or growing. Too much stress and people burn out; they feel as if they have no control over their lives. The objective of any manager is to find that happy medium — for your people as well as for yourself. Summary article by Emily Poe in FierceCIO; original posted by Dennis McCafferty in Baseline. Pursuing a career in IT has numerous perks, but unfortunately many IT pros are too stressed and overwhelmed to enjoy them. One of the obvious downsides is stress, as more than 30 percent of the survey respondents noted that their current job is the most stressful one of their career. A reason for that may be that many of them are expected to be on call 24/7, even when they are on vacation or off the grid. “36% said they’re expected to be available 24/7 during a work week, and 23% are expected to provide the same availability while on vacation,” the Baseline slideshow says. That kind of constant pressure would lead anyone to feel stressed out, and sometimes to look for new opportunities, according to the survey. Nearly 74 percent of the TEKsystems respondents said that a stressful work experience has caused led them to dust off their resumes and look for new employment–exactly what CIOs and IT leaders don’t want. However, there are quite a few perks to pursuing an IT-related career and things that keep your employees satisfied. Even though 30 percent of respondents said they were at the most stressful job of their career, 40 percent said their current job was the most satisfying yet. On top of that, 77 percent said they would choose IT as their career again, even if they went back and could choose any career path. eWeek covered the same survey earlier this year with slightly different takeaways. It focused more on the downward trend of employee satisfaction, which we outlined in a May FierceCIO article. But instead of focusing on the negative takeaways of the survey, it’s also good to remember that as an IT leader, you can take steps to improve employee dissatisfaction, help prevent burnout and buck the trend. So, what’s the takeaway for IT leaders who want to keep their employees happy and keep them in general? Try to keep an eye on your team’s stress level and let them know they can come to you when they’re feeling overwhelmed. Also, try and work with other members of your organization to ensure that they have realistic expectations of how much time and work IT can provide. Sometimes a worker may decide to seek out other opportunities no matter what, but other times you may be able to help address his concerns and make it a better working environment for him–and for the rest of the IT team. TEKsystems’ “IT Stress & Pride Survey” presents a classic good news/bad news picture when it comes to technology professionals and stress. First the bad news: A significant number of IT workers surveyed said their current stress level is higher than ever. The good news: These professionals take great pride in their work, and—even if they could start all over again—they’d still opt for a career in technology. “While the majority of IT professionals are proud they chose a career in IT, [there is] the potential of a trend toward dissatisfaction or disengagement that organizations need to monitor,” says Jason Hayman, market research manager for TEKsystems. TEKsystems provides IT staffing solutions, talent management expertise and services. Nearly 225 technology professionals took part in the research.